Elvis has re-entered the building! 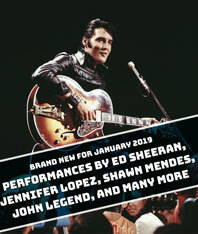 ELVIS ALL-STAR TRIBUTE (1 x 120’) is the brand-new, two-hour, NBC spectacular that celebrates the network’s iconic 1968 television event that helped the great Elvis Presley regain his glory and put himself back at the top of the charts. Produced by veteran music producer Ken Ehrlich ("The GRAMMY Awards®," "Elton John: I'm Still Standing," "A GRAMMY® Salute"), the special features an all-star group of music superstars who pay tribute to Elvis, recreating the spectacle – even the staging – of that unforgettable night. Celebrating the 50th anniversary of that epic evening are such top talent as Jennifer Lopez, Ed Sheeran, Blake Shelton, Shawn Mendes, Alessia Cara, Post Malone, Keith Urban, Carrie Underwood, Darius Rucker, John Fogerty, Kelsea Ballerini, Mac Davis, John Legend, Pistol Annies, Adam Lambert, Little Big Town, Yolanda Adams, and Josh Groban. Some of the many legendary, chart-topping songs covered by these artists include Heartbreak Hotel, Hound Dog, All Shook Up, Can’t Help Falling In Love, Jailhouse Rock, Don’t Be Cruel, Blue Suede Shoes, Love Me Tender, That’s All Right, Guitar Man, Trouble, and many more. In addition to the musical performances, the ELVIS ALL-STAR TRIBUTE includes rare Elvis footage, outtakes from the original special and interviews from those involved in the classic evening. We all know Elvis Presley as the "King of Rock 'n' Roll," but it was his '68 comeback special on NBC that truly secured his reign. In that one thrilling special, donning iconic black leather and performing some of his most unforgettable hits, Elvis staged a musical comeback in the form of a 60-minute television event that revived his incredible music career. Now, 50 years later, the ELVIS ALL-STAR TRIBUTE is the fitting salute to the man, his music, and the night he reclaimed his crown.